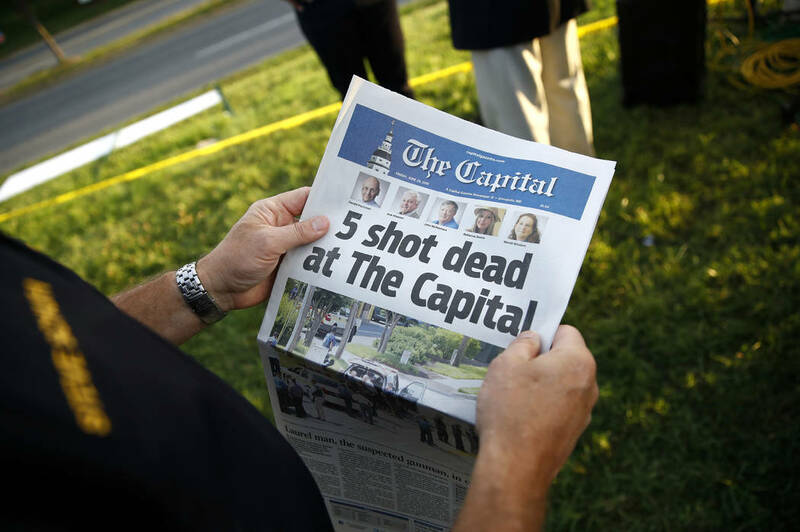 A man with a long grudge against Maryland’s capital-city newspaper was ordered held in jail Friday on five counts of first-degree murder after police said he blasted his way into the newsroom, killing five people. ANNAPOLIS, Md. — A Maryland man who blasted his way into a local newspaper office and systematically shot employees with a pump-action shotgun was charged with five counts of first-degree murder during a court hearing Friday. Jarrod Ramos, 38, of Laurel, Maryland, was charged in the Thursday attack on the newspaper and denied bail. He is being held in an Annapolis detention center. The gun violence in Maryland is the latest in a spree of mass killings that have occurred in recent months, including ones at a Florida high school, a Texas church and a music festival in Las Vegas, where 58 people died and hundreds wounded in what is now classified as the worst mass shooting in U.S. history. The organized attack prompted President Donald Trump to comment during an event in the East Room at the White House. “This attack shocked the conscience of our nation, and filled our hearts with grief,” Trump said. “Journalists, like all Americans, should be free from the fear of being violently attacked while doing their job,” said Trump, who has derided the media during campaign appearances as the enemy of the American people. 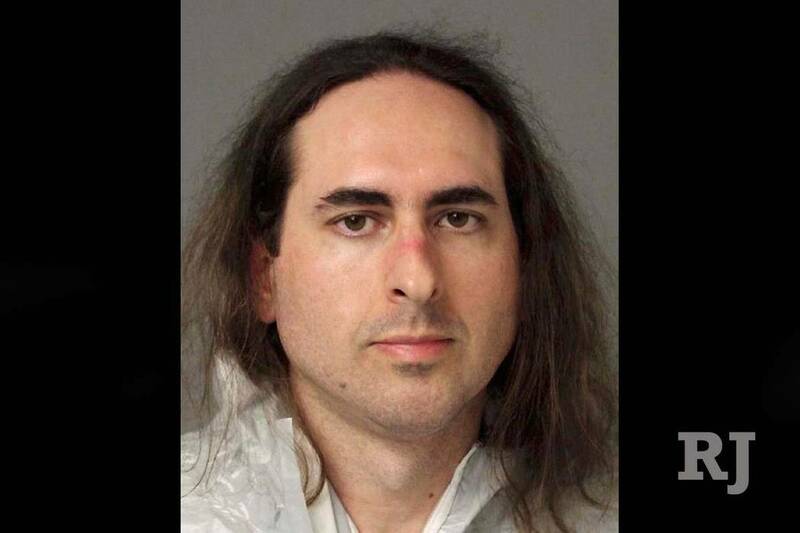 Police said Ramos was carrying out a vendetta against the Capital Gazette newspaper, and the motive may have been retaliation for reporting on a stalking case in which the suspect harassed a former Annapolis High School classmate online and on social media. Police also said there was a history of threats by Ramos against the newspaper, which began in 2013 after he unsuccessfully sued the Capital Gazette and reporter Eric Hartley, who wrote a column about the stalking case. Police spokesman Lt. Ryan Frashure said Hartley was in the courtroom when the Ramos case was heard and wrote a story about it. Ramos pleaded guilty to harassment in 2011, the Washington Post reported. The defamation suit filed by Ramos named Hartley and then-Editor Tom Marquardt. It was dismissed on appeal in 2013. “At this time, that appears to be a motive,” Frashure said. Frashure said some online banter between Hartley and the shooting suspect began after the case. Hartley could not be reached for comment. Hartley later worked at the Las Vegas Review-Journal from late 2014 to 2015 covering the city of Henderson. A Twitter account, @EricHartleyFrnd, believed to belong to Ramos, used Hartley’s altered image as its avatar. Several posts from the account harassed Hartley while he worked at the Review-Journal, as well as other staffers, including Michael Hengel, the paper’s editor at the time. 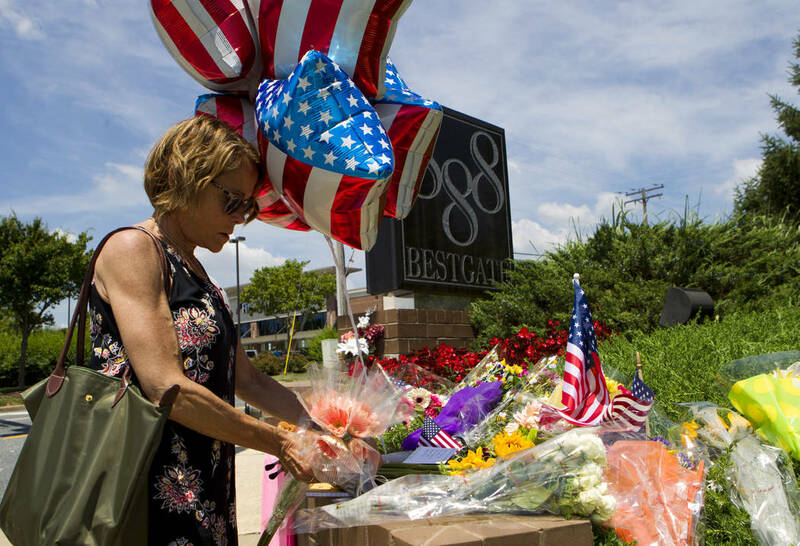 Online threats against the Capital Gazette were made in 2013, and police spoke with newspaper officials about filing charges. Marquardt was invited to take part in those talks, but did not participate, said Timothy Altomare, the Anne Arundel County police chief. 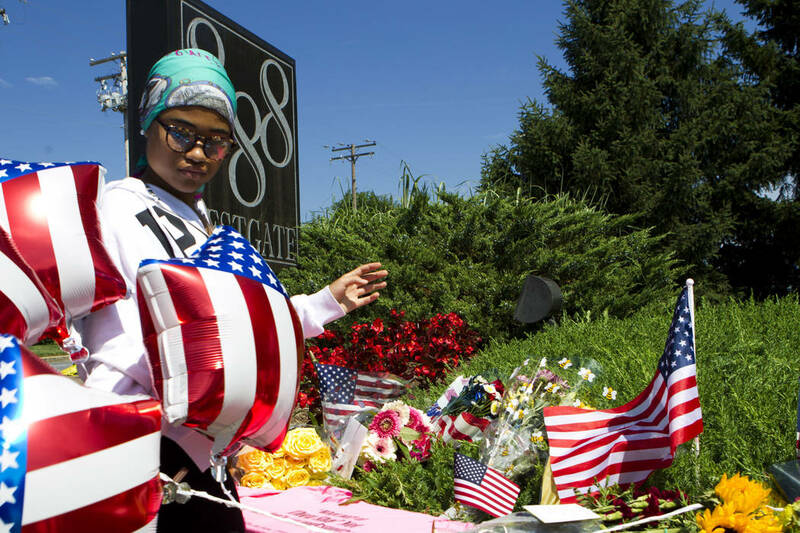 The newspaper decided against pressing charges to avoid antagonizing the shooting suspect, Altomare said. The chief said the threats were made generally against the newspaper, and not specific individuals. Police allege that Ramos, a computer engineer who had worked at the Bureau of Labor Statistics, used a 12-gauge, pump-action shotgun that was legally purchased a year ago to blast open the glass door of the newspaper offices on the first floor of an office building. He then walked through the newspaper and shot his victims, police said. Prosecutor Wes Adams said Ramos also had barricaded the newspaper’s rear exit to prevent anyone from escaping, and had an escape plan that he never implemented. After the first shotgun blast, journalists crawled under desks and sought other hiding places, describing agonizing minutes of terror as they heard the gunman’s footsteps and the repeated shots of the weapon. Three editors, a reporter and a sales assistant were killed in the afternoon rampage. 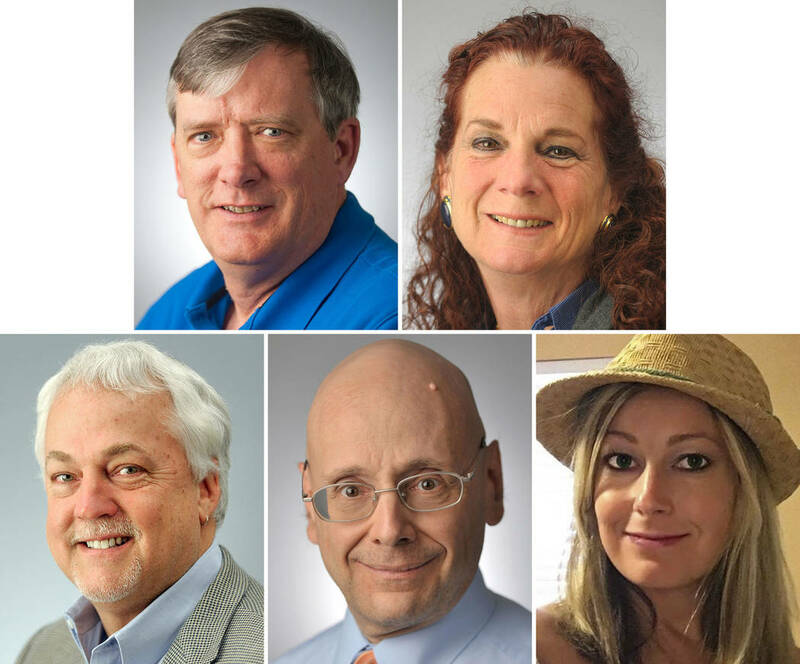 They were identified as Editorial Page Editor Gerald Fischman; Wendi Winters, the special publications editor; Rob Hiaasen, an assistant editor and columnist; reporter John McNamara; and sales assistant Rebecca Smith. Two others were injured in the attack, but police said their wounds likely were from broken glass. They were identified as Rachael Pacella and Janel Cooley. Maryland Gov. 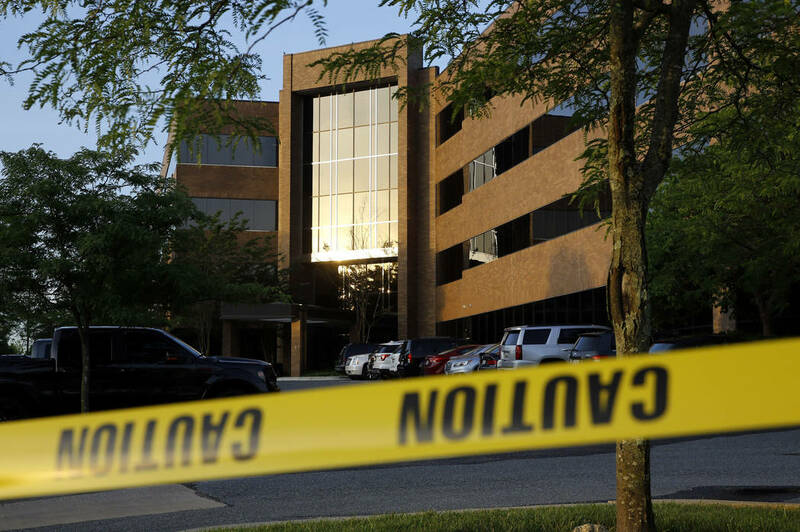 Larry Hogan and Anne Arundel County Executive Steve Schuh praised local police, who were on the scene within 60 seconds of the call of an active shooter at the newspaper. Police immediately entered the building and found the suspect hiding under a desk. No gunshots were exchanged between the suspect and police. “It’s a very tragic situation, but there were some very brave people who came in and kept it from being worse, and the response time was incredible,” Hogan said.